Naples hooked its first visitors with the lure of fishing and hunting. Today the playing field has expanded to a near Olympic-size range of sports and fitness activities. Miles of beaches provide a scenic setting for walking, jogging and running. City parks furnish workout gyms, lap pools, sports fields and courts, an in-line hockey rink, and other recreation. Fishing - Fishing excursions, charters and tours explore the fertile waters of Rookery Bay and Ten Thousand Islands for snook, redfish, sheepshead, tarpon and other local prizes. Or take you into fresh water for bass, crappie and blue gill. Or off to deep waters for grouper, dolphinfish and snapper. Fishing excursions are available at marinas in and around Naples, and can be arranged through hotels. On the Water - One of Naples' greatest pleasures consists of a day on the water. It could be by kayak. It could be by luxury liner. It could take you into the world of manatees and alligators, or on a tour of Naples' seaside mansions. However you picture aqua-adventure, Naples has all the right angles and shades of blue. You'll find charter services, tours and rentals at local marinas, resorts and parks. Golf - No place else has counted more golf holes per capita than Naples, land of exotic, palm-fanned links. 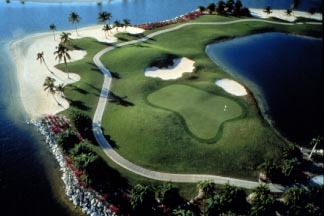 Two resorts have their own golf courses and others provide guest access to nearby private clubs. Several semi-private and public courses welcome golf travelers. A highly acclaimed local golf school teaches the basics and finer points of the game. Several professional golfers have homes in and around Naples, and the region hosts a senior PGA event. Racquet sports - Racquetball and tennis courts are located in city parks through Naples and vicinity, as well as at local schools, resorts and private clubs. Naples is home to the Nuveen Masters Tennis Tournament in March. Hiking - Many of our nature attractions provide boardwalks into the wilderness to keep visitors high, dry and informed. You can take a hike at any of these places: The Naples Nature Center, Briggs Nature Center, Fakahatchee Strand State Preserve, Collier-Seminole State Park and Corkscrew Swamp Sanctuary. Horseback riding - Mount an unparalleled adventure into wilderness sightseeing through Broken Gate Ranch (239-992-2555), which offers horseback riding at Pepper Ranch & Preserve, a 4,000-acre refuge in Immokalee. Naples Municipal Beach - Around the pier stretches a lovely, white-sand beach perfect for strolling and sunning. Facilities include rest rooms, shower, concessions and metered parking. Naples City Dock - The marina here is the center of boating activity in Old Naples. It's a great place to shop for charters, have lunch or merely stroll among the masts. Located on Naples Bay at 12th Avenue South; (239) 434-4693. Area Park - Often the site of outdoor concerts and events, many our park feature lighted tennis, horseshoe, shuffleboard and basketball courts, playgrounds --- Take a virtual Quick Tour of area Parks - complete with photos, descriptions and contact information. Everglades Island Airboat Tours Take guided airboat adventure through the grasslands, mangrove jungles, lakes and islands.